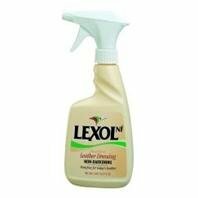 Lexol Neatsfoot Formula Leather Restorer, 500 ml Pump Spray. Use to restore problem, older or slightly dried leather. Apply sparingly with a Lexol Applicator Sponge or soft, 100% cotton cloth and allow the leather to absorb the emollients for 20-30 minutes and then wipe off the excess with another soft, 100% cotton cloth. Repeat once a week for as long as necessary to restore the flexibility and luster. Once the leather is restored, maintain it with Lexol Conditioner. Does not leave a greasy, oily finish like other all-purpose products. View More In Stable Supplies. If you have any questions about this product by Lexol, contact us by completing and submitting the form below. If you are looking for a specif part number, please include it with your message.